Are Christians merely forgiven, or do they possess the righteousness of Christ? Recently the time-honored understanding of the doctrine of justification has come under attack. 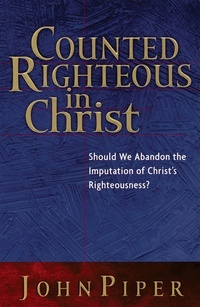 Many question how, or if, we receive the full righteousness of Christ. Martin Luther said that if we understand justification “we are in the clearest light; if we do not know it, we dwell in the densest darkness.” And now, in this important book, John Piper accepts Luther’s challenge. He points out that we need to see ourselves as having been recipients of the imputation of Christ’s righteousness and therefore enjoy full acceptance with God and the everlasting inheritance of life and joy. John Piper writes as both a pastor and a scholar. His pastor’s heart is shown in his zeal for the welfare of the church. His careful scholarship is evident in each explanation and undergirds each conclusion.